Synthetic peptide corresponding to Human Nanog aa 29-49. Our Abpromise guarantee covers the use of ab21624 in the following tested applications. WB 1/200. Detects a band of approximately 38 kDa (predicted molecular weight: 34 kDa). Some users report a stronger signal after blocking and diluting antibodies with 1% BSA instead of 5% milk. Sandwich ELISA Use a concentration of 0.5 µg/ml. For sandwich ELISA, use this antibody as Detection at 0.5 µg/ml with Mouse monoclonal [1E6C4] to Nanog (ab76586) as Capture. 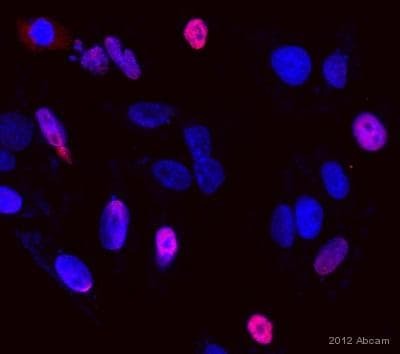 ab21624 at a 1/1000 dilution staining Nanog in human embryonic stem cells by ICC. 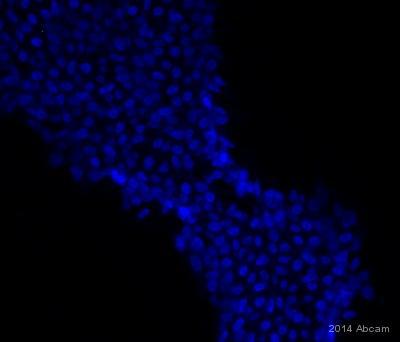 An antibody towards Oct4, which has an identical staining pattern to ab21624, was used as a positive control. 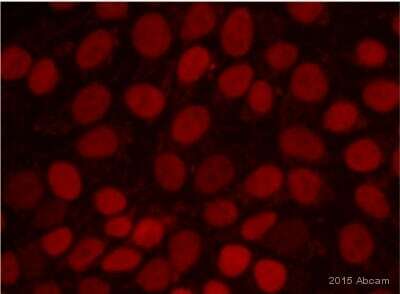 Lane 1 : whole cell extract of mouse 3T3 cells expressing mouse Nanog. Lane 2 : whole cell extract of mouse 3T3 cells expressing human Nanog. 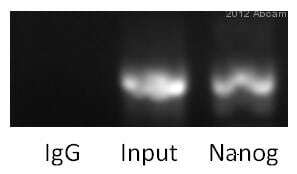 ab21624 recognizes human Nanog but does not recognize mouse Nanog in Western Blot. 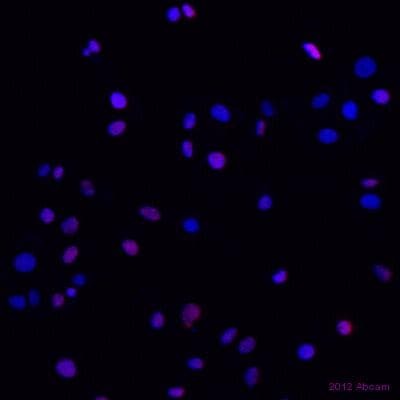 Immunocytochemical analysis of Human iPSCs labeling Nanog with ab21624 at 1/75 dilution. 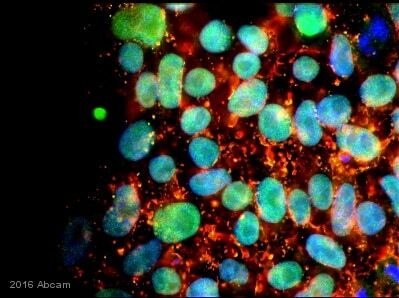 ab21624 staining Nanog in Human testis tissue sections by Immunohistochemistry (IHC-P - paraformaldehyde-fixed, paraffin-embedded sections). Tissue was fixed with paraformaldehyde and blocked with 10% serum for 1 hour at 20°C; antigen retrieval was by heat mediation with a citrate buffer (pH6). Samples were incubated with primary antibody (1/500 in PBS) for 12 hours at 4°C. 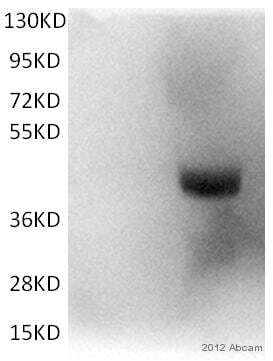 A Biotin-conjugated Goat anti-rabbit polyclonal (1/200) was used as the secondary antibody. Publishing research using ab21624? Please let us know so that we can cite the reference in this datasheet. I have received ab34222 and ab21624 and both vials did not contain the expected volume of product. ab34222 contained about 50ul instead of 200ul and ab21624 was about 70ul and should have been 100ul. I am sorry this product did not perform as stated on the datasheet and for the inconvenience this has caused. As requested, I have issued a free of charge replacement for one vial of ab34222 and one vial of ab13537.